The history of paperfolding is a fascinating one. This page links to a brief Timeline of Origami History and other pages collecting together more detailed historical information about the main historical sources, individual designs and wider themes. There is also a bibliography of the published designs of Robert E Neale. Folk art objects made of paper are ephemeral and the record we have of them at an early date relies largely on their chance survival or appearance in books, fabrics, drawings and paintings. It is likely that many paperfolding designs are much older than the earliest evidence for their existence. Unfortunately, of course, we cannot know, even approximately, how much older they might actually be. 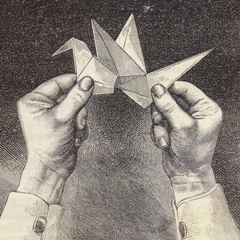 While I have long been interested in origami history there are many paperfolders who know much more about the subject than I do and these notes should be seen as a starting point for further research and not as a comprehensive guide. I have, however, tried to make them as accurate as possible by basing them on verifiable sources rather than myth or imagination. If you find any errors or inaccuracies in these notes or are aware of important sources I have overlooked please let me know.